The City Commander Trailer Set is made specially for Classics Ultra Magnus by Fansproject. Configurable as both a functioning trailer and as Ultra Magnus’ bulky appearance-altering battle armor, the City Commander set appears to integrate aesthetically and to preserve Classic Ultra Magnus’ full array of articulation. The additional height and girth auspiciously provided by the City Commander battle armor should hopefully cause Classics Grimlock to cease referencing Classics Ultra Magnus as “Little Prime”, and should help to restore some of Ultra Magnus’ characteristically malnourished self-confidence. 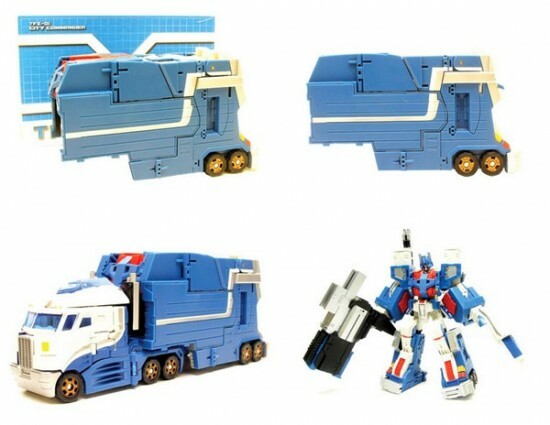 The Fan Project Ultra Magnus City Commander Set is sold out! Steven and David, please reserve 1 set for me 🙂 Do let me know as soon as this arrives 🙂 🙂 :)Thank you – Andrew.